UK Quad for seminal western. The Good, The Bad and The Ugly. Eastwood's'man with no name', Ennio Morricone's musical score and Sergio Leone's directing make for, possibly, the greatest spaghetti western of all time. Professionally cleaned, de-acidified and linen-backed. Actual poser size is 30 x 40 inches (31 x 41 inches including the linen-backing). 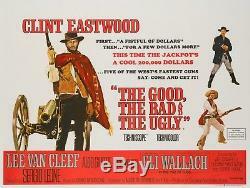 The item "Original The Good, The Bad and the Ugly, UK Quad, Film/Movie Poster 1966, Linen" is in sale since Wednesday, September 5, 2018. This item is in the category "DVDs, Films & TV\Film Memorabilia\Posters\Originals - UK Quads\1970s".